Why an application - because it is a great way for us to learn more about you, your family situation, your lifestyle and why you are interested in a Panthera puppy. The next thing we do is give you a call so that we can get to know you better. We will discuss any questions that we have with regard to your answers and we will happily answer any questions that you may have for us. Additionally, we may ask to see pictures of your home, yard and any other animals that live with you. If all checks out, you will be placed on our waiting list. You will then begin to receive frequent updates as to the status of the pregnancy, whelping, and development of the puppies. Our Facebook page Panthera Leos will have the latest information and we will update the website and send out emails as we find time. We ask for a deposit once the puppies are born and we have confirmed that we have a puppy for you. 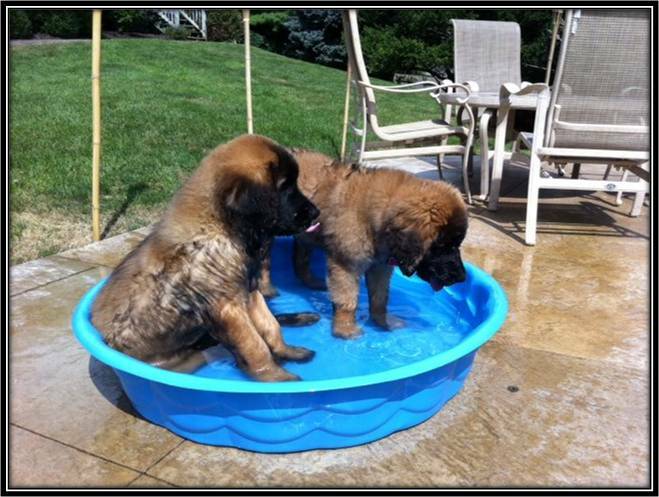 Your deposit is non-refundable unless we are able to find another home prior to the puppies leaving at 8 weeks old. We will choose your puppy for you. We do this based upon the information you provided in your application and by spending countless hours with the pups getting to know their emerging personalities. Furthermore, the puppies are temperament tested at 7-8 weeks of age and we also use that information to finalize the home placement. We do not ship our puppies so you must be prepared to come to pick your puppy up. It gives us a chance to meet you in person if we have not already done so previously. No Panthera puppy leaves for its new home before it is 8 weeks old. If you are interested in adopting a Panthera puppy, please contact us for a Puppy Application.